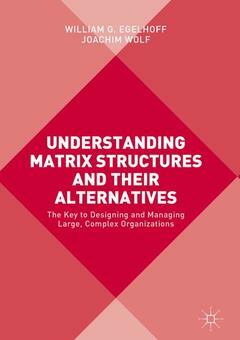 This book describes the use of matrix structures in large, complex organizations such as MNCs. Using an information-processing perspective of organization design, it develops a more comprehensive theory for fitting the structural configurations of matrix structures to key characteristics of firm strategy. Empirical research by the authors supports this theoretical framework. In addition to structural configuration, Understanding Matrix Structures identifies and develops the mode of decision making within a matrix as an important second dimension of matrix structure design. It can be either balanced (joint) decision making by the two dimensions of a matrix or rule-based decision making, where rules pre-assign certain decisions to one dimension or the other for unitary decision making. Recent exploratory research by the authors supports this conceptual framework and provides the potential to create a more flexible matrix structure- one that facilitates a more ambidextrous organization. Chapter 1 Introduction.- Chapter 2 The Historical and Conceptual Contexts for Understanding Matrix Structures.- Chapter 3 Designing Elementary Structures to Fit MNC Strategy.- Chapter 4 Designing Matrix Structures to Fit MNC Strategy.- Chapter 5 Understanding the Causes of Conflict in Matrix Structure Firms.- Chapter 6 Decision Making within Matrix Structures.- Chapter 7 How a Flexible Matrix Structure Supports a More Ambidextrous Organization.- Chapter 8 The Joint Use of Matrix Structures and Network Designs to Implement Multi-dimensional Strategies.- Chapter 9 Conclusion. William G. Egelhoff is Professor Emeritus at Fordham University, USA. Joachim Wolf is a Professor at University of Kiel, Germany, where he holds the Chair of Organization Theory and Design.